IrishCallcards.net is your one stop for all things Callcard (Irish Phonecards). First introduced in Ireland by Telecom Eireann (now Eircom) in 1988, throughout the years many different callcards were produced. Ranging from commemorative to advertising and special edition releases, Callcards were widely collected throughout Ireland and worldwide during the nineties. IrishCallcards.net features a complete image gallery with high definition images of all Callcards ever produced, discussion forums and a marketplace for past or current collectors interested in selling or swapping callcards. A question I am quite often asked, do Callcards still work? The answer may surprise you. 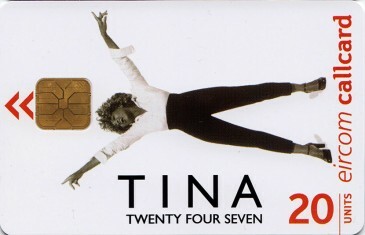 Callcards lost popularity back in the late nineties due to the increase in affordable mobile phones. Gradually shops stopped stocking Callcards and Eircom (now Eir) started to decrease the number of public payphones. 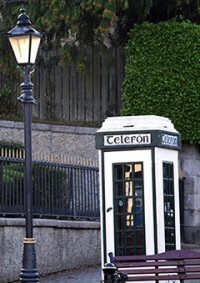 By the end of 2009, Eircom have already removed half of all phoneboxes. The current payphone type Eir implemented back in the early ‘00s function as both a coin and card payphone. Even to this day the cardphone functionality is still active. This means that Callcards with remaining units can still be used today! Just after the millennium Eircom produced a new variety of Callcards, rather than the Callcard containing a Unit for credit, a cash value was used instead. Prior to the euro changeover earlier Callcards displayed the price in Irish Punts (£) and can be seen on the early Simply Talk series. 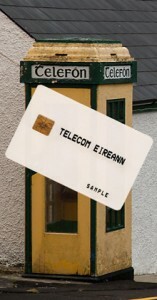 Before Callcards became an iconic symbol of nineties Ireland, an advanced trial and rollout took place by Telecom eireann in the late eighties. This roll out saw trials conducted in cities Dublin, Galway and Limerick. The cards tested during these trials relied on magnetic and optical strips which held the credit or “units”. After the short 2 year trial Telecom Eireann decided to test the relatively new chip based smartcard technology for their Callcards. These cards were durable, modern and most importantly more secure. In a bold move by Telecom Eireann Ireland became one of the first countries in the world to implement chipped phonecards. These cards were more expensive to produce than magnetic or optical cards. Prior to the nationwide Cardphone rollout many cards were produced by different manufacturers to test that their cards would be compatible. These cards were usually marked “SAMPLE” or “TEST”. Unlike private Callcards test cards were never available to the general public. They were produced in very limited quantities and provided to engineers in charge of maintaining and deploying the cardphones. As these test cards were never intended for public access they mostly contained very plain designs. Some also had larger unit values than available to the general public, including 120 and 150 units for example. The first known test cards were produced by manufacturers Schlumberger and Gemplus. These were catalogued as Telecom Eireann Demo 1, Telecom Eireann Demo 2, and Telecom Eireann Demo 3 "Ireland's First Callcard" (pictured). These cards, particularly Demo 1 and 3 are extremely rare. Many test cards, particular the early ones were returned to the manufacturer after testing was conducted to be retested and then destroyed. Telecom Eireann and Eircom phoneboxes in TV and film! Dating all the way back to March 1998 the Father Ted Episode Speed 3 features the villain towards the end using a Telecom Eireann phonebox. It is not obvious if a Callcard or coinphone is being used during this short clip!